Served from an ex-chateau bottle. 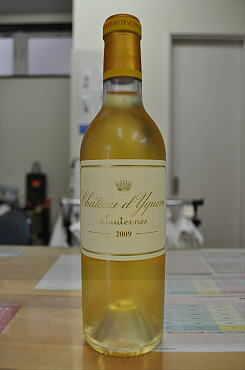 The 2009 Chateau d’Yquem is one showstopper of a wine and perhaps it is only in a vertical that you realize this is up there among the legendary wines of the past ? the 2001 included. It has a wonderful nose that expresses the Semillon component majestically: heady aromas of lemon curd, nectarine, jasmine and honeysuckle that all gain momentum in the glass. The oak is supremely well-integrated. The palate is extremely well-balanced with an unctuous entry. You are immediately knocked sideways by the palpable weight and volume in the mouth, which is almost “bulbous,” with layer upon layer of heavily botrytized fruit. It builds to a spicy finish with hints of marzipan and pralines in the background that lend it an untrammeled sense of exoticism. The 2009 is utterly fabulous and decadent, a star that will blaze brightly and undimmed for many years. Drink now-2060+. Tasted March 2014. Served from an ex-chateau bottle. 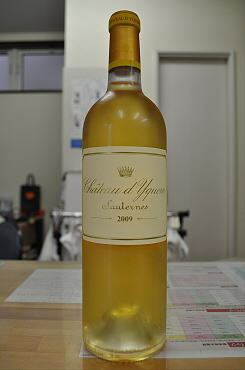 Picked in one trie, the 2003 Chateau d’Yquem is slightly deeper in color compared to the 2004. It is attired with an intriguing bouquet with Manuka honey, quince, honeycomb and a touch of nougat, though it does not have the pixilation of a top vintage. The palate is unctuous right from the start: gloopy in texture with hedonistic ripe honeyed fruit laced with orange zest and a strong spicy note on the finish. It has moderate length, but finishes with plenty of glycerine in the mouth. 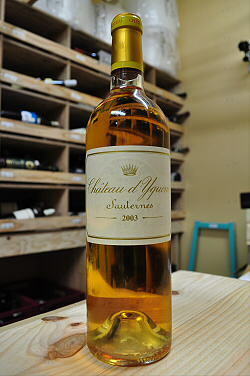 This is certainly the finest 2003 Sauternes. Served from an ex-chateau bottle. 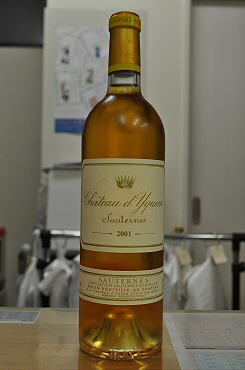 The 1995 Chateau d’Yquem is moving into its secondary aroma phase. A deep golden color, it has a dense and almost Barsac-like bouquet with tangerine, apricot, acacia and melted candle wax. It displays good intensity, unfolding beautifully in the glass. 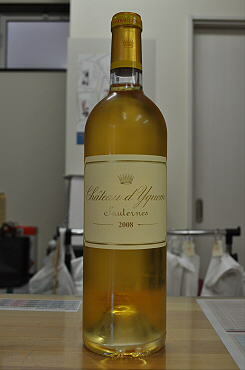 The palate has a strident opening, with a slight bitter edge that lends this Yquem great tension. One can discern layers of marmalade infused with honey fruit, with a powerful, spicy finish that lingers long in the mouth. This is drinking perfectly now, but will surely age with style over many years. Tasted March 2014. There is no other wine in the world like it, and there is no other luxury wine that can possibly justify its price as much as Yquem. The remarkable amount of painstaking labor necessary to produce the nectar known as Yquem is almost impossible to comprehend. This is a fascinating effort. With greater evidence of botrytis than the colossal 1983, but less power and alcohol, the 1986 Yquem tastes reminiscent of the 1975, only more precocious, as well as more concentrated. Several highly respected Bordeaux negociants who are Yquem enthusiasts claim the 1986 Yquem is the greatest wine produced at the property since the legendary 1937. Its enthralling bouquet of pineapples, sauteed hazelnuts, vanillin, and ripe apricots is breathtaking. Compellingly concentrated, the breadth as well as depth of flavor seemingly know no limits. 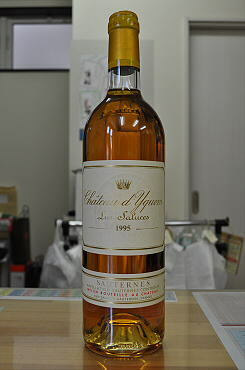 This full-bodied, powerful, yet impeccably balanced Yquem should provide memorable drinking for 40-55 more years. Like the 1983, this is another winemaking tour de force. Anticipated maturity: 2000-2040. Last tasted, 4/91.